Figures 1a and b. The erythematous eruption on the patient’s trunk with associated exfoliation. Scattered areas of normal skin are visible. 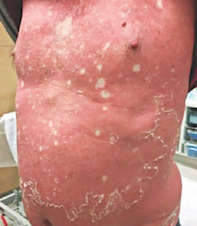 A 56-year-old man presents with a gradually worsening, pruritic, erythematous eruption involving approximately 90% of his body surface area, with associated exfoliation (Figures 1a and b). Yellow hyperkeratosis is noted on his palms and soles. Conditions to consider among the differential diagnoses for a patient with erythroderma (an eruption involving over 75% of the body surface area) include the following. Atopic dermatitis. The most common cause of erythroderma is the exacerbation of a pre-existing inflammatory dermatosis, most often atopic dermatitis. Atopic erythroderma presents most frequently later in adult life but can occur at any age. The exacerbation of existing lesions usually precedes the more generalised eruption and pruritus is usually intense. Patients typically have a significantly raised IgE level. Psoriasis. Erythrodermic psoriasis can be potentially life-threatening in unwell or frail patients. In addition to erythema, scaling, exfoliation and desquamation can sometimes occur. When the erthroderma is fully developed the specific features of psoriasis are often lost, although scalp scale and nail changes may provide a clue. 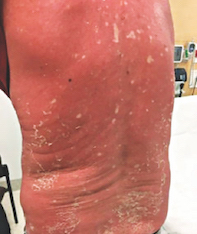 More than half of all cases of erythrodermic psoriasis are attributed to the exacerbation of pre-existing psoriasis, particularly during withdrawal from oral prednisone. Other important triggers include medications (e.g. lithium, beta blockers), infections, alcohol consumption and emotional stress. Sézary syndrome. This is an aggressive leukaemic variant of cutaneous T-cell lymphoma in which a significant number of circulating malignant (Sézary) cells are observed in the peripheral blood. Patients with Sézary syndrome commonly present with widespread erythema and generalised lymphadenopathy developing over weeks to months. The skin is often extremely pruritic and the erythroderma can be finely scaly or indurated. Drug eruption. A wide variety of drugs have been reported to cause erythroderma, including allopurinol, carbamazepine, cimetidine, lithium, penicillins, phenytoin and sulfonamides. Multiple patterns of drug reaction can occur, including maculopapular, morbilliform and scarlatiniform. It is important to remember that the cutaneous manifestations of drug hypersensitivity may be accompanied by other organ involvement – this constitutes the severe drug reaction known as DRESS (drug reaction with eosinophilia and systemic symptoms), which can be prolonged and life threatening. Drug-related erythroderma often takes two to six weeks to resolve. Pityriasis rubra pilaris (PRP). This is the correct diagnosis. PRP is an idiopathic condition characterised by erythroderma that progresses cephalocaudally. It is scaly and the scale can involve the scalp. The skin on the palms and soles often has a yellow-orange discolouration. PRP rarely begins in childhood and more frequently occurs in late middle age. The presence of follicular, horny plugs on the knees, elbows and the backs of the fingers is distinctive. In many cases there are scattered islands of normal skin in the erythrodermic regions (‘islands of sparing’ – see Figures 1a and b), which are very suggestive of the diagnosis. Erythroderma is a potentially fatal condition. Treatment in hospital is often necessary to monitor patients and to restore fluid and electrolyte balance, circulatory status and body temperature. commencing systemic therapy, which is usually necessary once an underlying cause is identified. For patients with PRP, systemic treatment is required, with the most effective medication being acitretin. This retinoid must be prescribed by a dermatologist, so specialist referral is recommended. A familiarity with the advanced use of systemic retinoids is required because response is characteristically slow and side effects may be troublesome. Not all patients tolerate or respond to retinoids; in this situation methotrexate is the drug of second choice. Dr Forward is a Dermatology Research Fellow at Royal North Shore Hospital and Clinical Associate Lecturer at The University of Sydney. Associate Professor Fischer is Associate Professor of Dermatology at Sydney Medical School – Northern, The University of Sydney, Royal North Shore Hospital, Sydney, NSW.